The American paddlefish -- known for its bizarre, protruding snout and eggs harvested for caviar -- duplicated its entire genome about 42 million years ago, according to a new study published in the journal Genome Biology and Evolution. This finding may add a new twist to the way scientists study how fins evolved into limbs since the paddlefish is often used as a proxy for a more representative ancestor shared by humans and fishes. "We found that paddlefish have had their own genome duplication," said Karen Crow, assistant professor of biology at San Francisco State University. "This creates extra genetic material that adds complexity to comparative studies. It may change the way we interpret studies on limb development." In order to study how human limbs develop, scientists compare the limb-building genes found in mice with fin-building genes found in fishes. 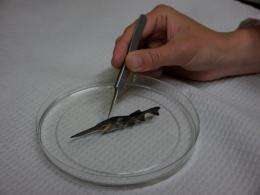 Previous research on paddlefish has suggested that fishes possessed the genetic toolkit required to grow limbs long before the evolution of the four-limbed creatures (tetrapods) that developed into reptiles, birds, amphibians and mammals. In the last decade, paddlefish have become a useful benchmark in evolutionary studies because their position on the evolutionary tree makes them a reasonably good proxy for the ancestor of the bony fishes that evolved into tetrapods such as humans. However, the fact that paddlefish underwent a genome duplication could complicate what its genes tell us about the fin-to-limb transition, says Crow. "Our findings suggest that the results of previous studies using paddlefish as a comparative species may need to be re-interpreted," Crow said. Crow and colleagues sequenced chromosomal regions containing 19 Hox genes in the American paddlefish. Hox genes determine body shape and limb development, and have become prime candidates for detecting whole genome duplications. Whole genome duplications are game-changing events in evolutionary history that give rise to new species or novel features within a species. They occur when a series of unlikely circumstances coincide, resulting in twin copies of every gene. When this happens, one scenario that could take place is that one gene in the pair keeps its designated function while the other is either lost or takes on a new purpose. "This extra genetic material provides the canvas for evolution to paint with," said Crow, who studies the evolution of novelty and diversity. Two milestone genome duplications are believed to have taken place before the evolution of jawed vertebrates. Additional whole genome duplications have also taken place further down the evolutionary tree, in specific lineages or branches, but it is a phenomenon more common in plants than animals. "Our findings on the paddlefish suggest that whole duplication is not as uncommon in animals as previously thought," Crow said. A genome duplication must be an extreme mutation, if I understand the situation. So on one unlikely day a newborn creature has doubled it's genome, or it is a slow process? How different would it be from its predecessors? Like a scooter from a car? From what I've read, the doubling occurs in one go during a faulty cell division. The offspring with a doubled genome would be the same as the parent, just with two copies of every gene. The key idea is that now that there are two copies of the genome, one copy can mutate and develop new functionality while the other copy maintains the previous functionality. It adds many possible paths to new variation that would have damaged the organism had there only been one copy of the genes. For example onions have such polyploidy, often tetraploidy i.e. quadrupling, between very similar looking ones. In plants, whole genome duplication can lead to speciation in 1-3 generations in extreme cases I think.